I don’t have a sell signal yet, but it’s close. 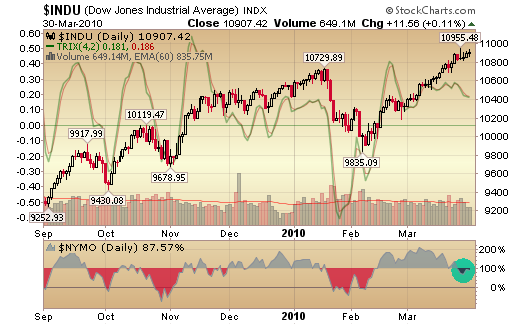 It feels likeIn this chart the market continues to make new highs while the NYSE McClellan Oscillator drifts into red territory. The TRIX is also showing negative divergence. It’s difficult to watch many individual stocks hit new highs and feeling like one is missing opportunity, but the market is in a precarious spot here and being careful here is important. Two decent long charts that caught my eye are CRUS and DHR for those looking for breakouts. I’m sitting on my small QID position and looking to add more contras when/if the market does correct.